Since we first spoke to Daniela last fall, she has continued to demonstrate her drive and commitment to her future. After completing her internship at Hexagon Mining, she moved onto internship opportunities at both IBM and American Express. 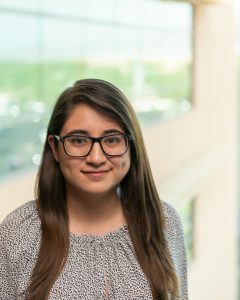 Daniela is now heading into her final year at the University of Arizona, while continuing to work as a software development intern at IBM. As she starts to consider life after college, Daniela’s goal is to work at an established local company like IBM or explore her options out of state at a software startup where she can put her talents and expertise to good use, before returning to Arizona and putting down roots. She credits Earn to Learn for not only helping to improve her financial literacy, but also in helping her to develop professionally. Attending internship-readiness workshops and getting her resume prepped by the Earn to Learn staff pushed her to be a strong candidate for quality positions.